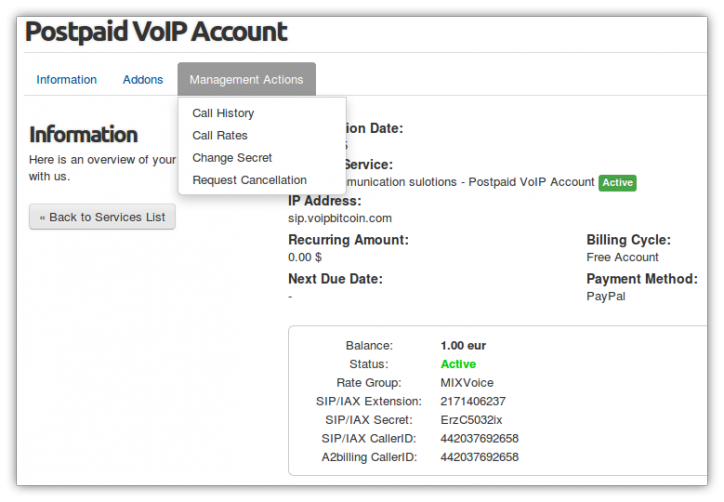 A2billing WHMCS Post-paid module allows you to offer SIP/IAX VoIP subscriptions on a2billing - Asterisk, And charge fixed monthly fees and or setup fees for each extension. The module will also import from a2billing the monthly call usage amount and create an invoice in WHMCS, Once paid it will also add the payment in A2billing to keep the reports correct. With this module set up, you can further secure your A2billing server and use WHMCS as your client front end instead of A2billing client area. All client area files are fully editable & customizable using the provided .tpl template files. Uppon invoice payment in WHMCS, the module Will automatically mark the invoice as paid in A2billing, as well as create receipt & e-payment logs to keep correct reports data. Be the first to review A2billing - WHMCS Create & Control Post Paid VoIP accounts Module (A2Post Paid). In addition to the daily invoice synchronization with a2billing, now its possible to manually synchronize invoices by entering the desired date.